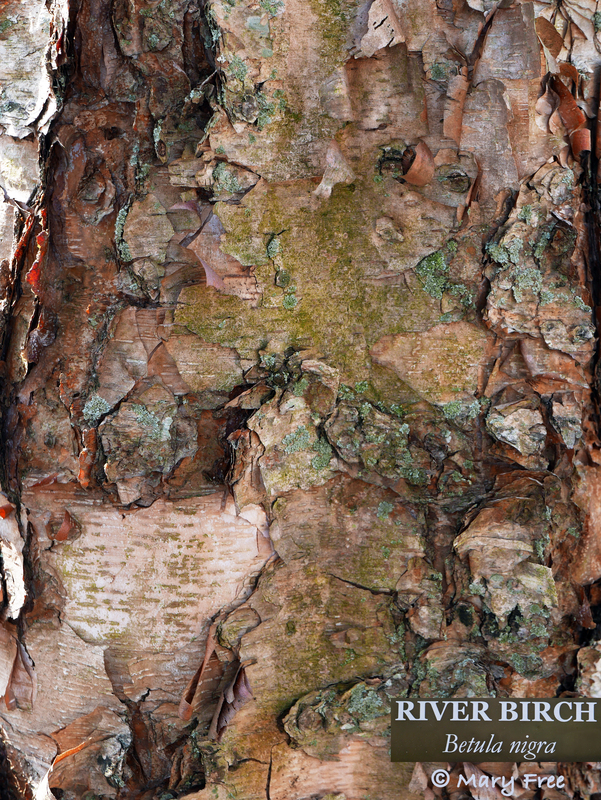 Close-up of the lichen-dotted bark of a Betula nigra (river birch, red birch) tree in New London, Connecticut. The five birch trees listed below are native to different areas of the mid-Atlantic region. Their uses in a cultivated landscape are varied. Those with the showiest bark shine year-round as specimen, shade, or lawn trees. Some are at home in naturalist settings. Others thrive in poor soil and difficult sites. As with all plants, it is best to grow species native to one’s particular area, as they have adapted to local conditions and have the best chance for success. Numerous pathogens and pests can attack birches. They are most susceptible to these when grown outside of their native range. The stresses of inhospitable environments (hot summers, mild winters, dry and alkaline soils) weaken those birch trees, making them more prone to disease and vulnerable to pests, especially the bronze birch borer, which can kill them. Betula papyrifera (paper birch, canoe birch, American white birch): Arguably the most visually appealing white-barked Betula species, this is the first tree that comes to mind when one utters the word birch. The orange-brown bark on young trees turns white in about four seasons and peels off in paper strips; coarse black areas don’t appear until the tree is older. It is short-lived and thrives in the northern part of the mid-Atlantic (and around the upper Great Lakes and in New England) where summers are cooler. It does not like heat or humidity and is not native to Virginia. In its native range, it makes a decorative lawn or specimen tree. Betula populifolia (gray birch): Another short-lived, chalky white birch with non-peeling bark is distinguished by dark chevron or triangular patches at the base of each branch. The only native population in Virginia is in the vicinity of Big Meadows in Shenandoah National Park. This native population is distinct from those in central and eastern Pennsylvania up through New England (Virginia Botanical Associates 2019), where birch is a common, early-succession tree in poor or disturbed sites and burned areas. In its native range, this birch is easy to grow and a good choice for difficult sites and naturalized areas. Betula alleghaniensis (yellow birch): This birch is common in the higher mountains of Virginia and Maryland, through Pennsylvania and up to New England. Although not white, its showy bark stands out in the landscape on a lawn or in a naturalized area. Smooth and shiny, yellow to amber to silvery in color with long horizontal lenticels, the bark exfoliates in thin shreds or rolls. A platy outer bark develops as trunks and limbs reach a certain size. Scraped branches exude a mild scent of wintergreen. Like its predecessors above, Betula alleghaniensis prefers cooler climates and does not adapt well to heat and drought. Betula lenta (sweet birch, black birch, cherry birch): Finally, a birch native to Northern Virginia (except for Prince William County), it is native through much of the mid-Atlantic region, although rarer in the Coastal Plain. Reddish-brown young bark with distinct horizontal lenticels does not exfoliate and ages from gray to black with scaly plates. Scraped branches have a stronger wintergreen fragrance than yellow birch. Although its bark is not as showy as other birches, it displays the best in fall with golden-yellow foliage. Betula lenta is more heat and drought tolerant than the birches listed above and would make a lovely addition to naturalized areas. Betula nigra (river birch, red birch): This showy birch is commonly found in the Piedmont and Coastal Plain of the mid-Atlantic region. It is more disease-free and better adapted to heat than other birches. “The densest, most multi-layered outer bark of any birch species” (Morris and Jansen 2017, 52) peels off in shades of gray and cinnamon to reveal a creamy to salmon-colored inner bark. Older trunks are deeply furrowed, pink-tinged gray to red-brown. The foremost cultivar of Betula nigra ‘Cully’ (also sold as HERITAGE®) is featured in the video “The Beauty of Birch,” ‘Cully’ exfoliates more heavily than the species and other cultivars, with a greater combination of outer bark colors and a light—sometimes almost white—inner bark. As a bonus, it is vigorous and extremely resistant to bronze birch borer. Planted as a lawn or specimen tree or in a naturalized setting, this birch draws attention in all seasons. This entry was posted in MG in the Garden, Public Education and tagged American white birch, Betula alleghaniensis, Betula lenta, Betula nigra, Betula papyrifera, Betula populifolia, black birch, canoe birch, cherry birch, gray birch, paper birch, Red Birch, River birch, sweet birch, yellow birch. Bookmark the permalink.